AMERICAN DREAM 48 • SHOPPING CENTER BUSINESS • August 2018 T he numbers behind Triple Five Group's American Dream Miami project are tough to comprehend. At more than 6 million square feet, it will easily become the largest mall in the Unit- ed States. The Canadian developer also antici- pates more than 30 million visitors annu- ally, which is approximately the combined annual attendance for Disney World and Universal Studios. The project is also slat- ed to employ roughly 25,000 permanent jobs, not to mention the large amount of construction jobs needed to help make American Dream Miami a reality. At such a grandiose scope and a price tag expected to be north of $4 billion, American Dream Miami is an exclamation point for both the South Florida market and how developers view the long-term growth prospects of retail real estate. "It's a statement project," says Ken Krasnow, executive managing director of Colliers International's South Flor- ida office. "American Dream Miami is a destination that will help unlock new markets and developments." Triple Five is no stranger to large- scale malls, having developed two of the biggest in North America: the Mall of America in Minneapolis and the West Edmonton Mall in Edmonton, Alberta. 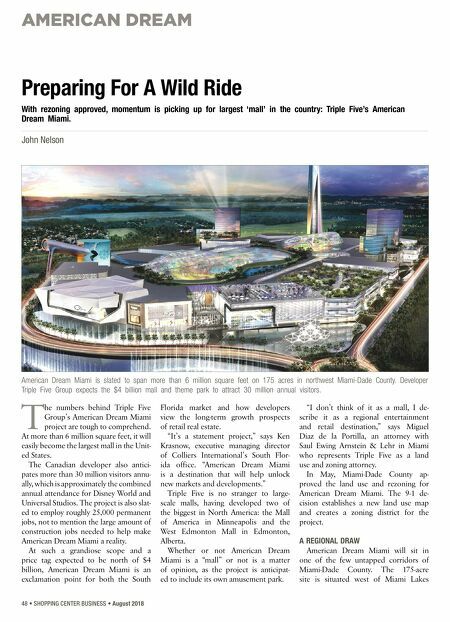 Whether or not American Dream Miami is a "mall" or not is a matter of opinion, as the project is anticipat- ed to include its own amusement park. 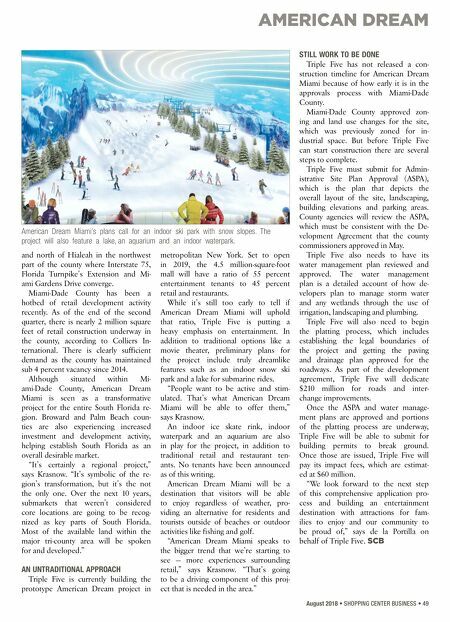 "I don't think of it as a mall, I de- scribe it as a regional entertainment and retail destination," says Miguel Diaz de la Portilla, an attorney with Saul Ewing Arnstein & Lehr in Miami who represents Triple Five as a land use and zoning attorney. In May, Miami-Dade County ap- proved the land use and rezoning for American Dream Miami. The 9-1 de- cision establishes a new land use map and creates a zoning district for the project. A REGIONAL DRAW American Dream Miami will sit in one of the few untapped corridors of Miami-Dade County. The 175-acre site is situated west of Miami Lakes Preparing For A Wild Ride With rezoning approved, momentum is picking up for largest 'mall' in the country: Triple Five's American Dream Miami. John Nelson American Dream Miami is slated to span more than 6 million square feet on 175 acres in northwest Miami-Dade County. Developer Triple Five Group expects the $4 billion mall and theme park to attract 30 million annual visitors.